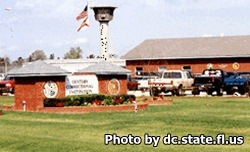 Century Correctional Institution is located in Escambia County Florida. It is a level V facility that currently houses over 1,340 adult male inmates of all custody levels. Inmates at this institution are offered a variety of educational courses that include: Adult basic education, GED, literacy, and English as a second language courses. Inmates with substance abuse issues are encouraged to take the pre-treatment program, and participate in AA and NA meetings. This facility allows eligible inmates to take part in community work squads. The community work squads give inmates various jobs within the surrounding community working for the department of transportation, division of forestry and other interagency and contracted positions. Once you have completed a visitors application and it has been approved you are eligible to visit an inmate. The visiting days and times for this facility are Saturdays and Sundays from 9am-3pm (Eastern Standard Time, 8am-2pm CST). Registration begins at 8:15am and ends at 2pm (1pm CST).